Japan has always been a fertile breeding ground for architectural theories. In this country, the combined action of natural and man-made disasters and corporate speculation all too often condemns many buildings — if not whole cities — to an unnaturally short existence, thus forcing local architects to constantly rethink the form and function of the urban environment. 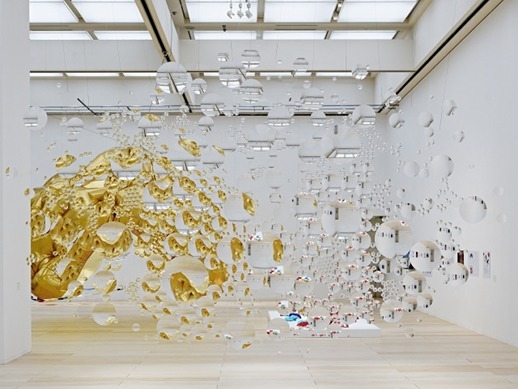 In the last few years, though, the Tokyo art world seems to have caught architectural fever like never before: Many museums and galleries have been trying to top each other with ever-bigger and imaginative exhibitions, ranging from world-famous architects to collective projects. While the retrospective on the Metabolism movement currently at the Mori Art Museum is a historically faithful but rather ponderous and unsurprising display of the usual drawings and models, other recent exhibitions, like Toyo Ito’s monster project at the Tokyo Opera City Gallery in 2006 and Tadao Ando’s 2008 solo show at Gallery MA, have blazed a new trail in transforming the exhibition space itself into an exciting work of art and an interactive experience. Another interesting trend has been the progressive blurring of the distinction between art and architecture, where the viewer constantly wonders whether the models on display actually have something to do with houses and cities. 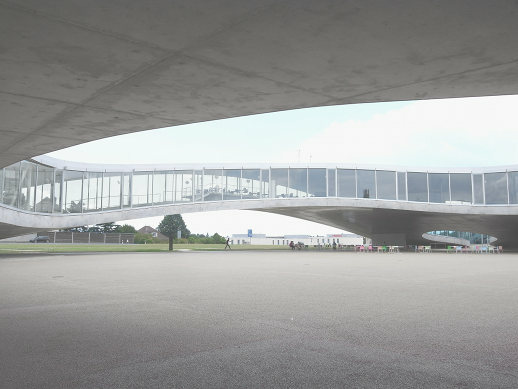 It is not surprising, then, that the Museum of Contemporary Art, Tokyo has decided to put the two things under the same roof in its latest project, “Architectural Environments for Tomorrow,” the second installment in the Tokyo Art Meeting exhibition program by the Tokyo Culture Creation Project. Kazuyo Sejima and Ryue Nishizawa, the world-famous dynamic duo who usually hide themselves behind the SANAA moniker, have collaborated with MOT’s chief curator Yuko Hasegawa to gather twenty-eight architects and artists from fourteen countries for this exhibition. Between historical figures like Frank O. Gehry and Toyo Ito, up-and-coming youngsters like Sou Fujimoto, Akihisa Hirata and Haruka Kojin, and other less known international talents, we have a wide variety of styles and approaches. As Nishizawa said at the preview, both art and architecture are like a mirror reflecting society and the world at large as they change through time. Simultaneously, Nishizawa and Sejima, who look like they would more likely be sitting in a Left Bank café in Paris than behind a drawing table, stress the need for today’s creative people to respond to recent environmental changes brought about by new lifestyles and rising demographic pressure on the urban landscape. The best way to do this, according to the curators, is to show the way towards a new philosophy of life made up of different coexisting models. On a practical level, for this particular exhibition they got rid of walls and partitions, and the cavernous spaces of the MOT were turned into a huge colorful bazaar; a chaotic display of drawings, models, images, sculptures, photos, and elaborate mix-media installations. As it often happens in such cases, the plurality of voices runs the risk of pushing the unifying message into the background. Still, many of the works on display stand out on their own merit as visually stunning, thoughtful meditation on architecture. Some of the more interesting works address the need to reaffirm mankind’s communion with nature. Tetsuo Kondo’s “A Path in the Forest,” for instance, is an up-and-down walking path that, like a roller coaster, winds around trees. The installation, that was designed for a 300-year-old forest near Tallin, Estonia, directly puts people face-to-face with nature in order to stress our dependence on it for our survival. This is a statement whose importance we can hardly overlook. 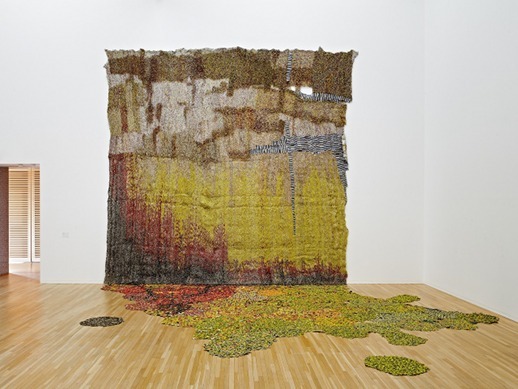 On the other side, Ghanaian artist El Anatsui’s “Garden Wall”, made of throwaway bottle seals, reminds us of both traditional African tapestry and the green walls that are becoming increasingly popular as an ecological alternative to air conditioners as they screen the buildings from the sun and the summer heat. Though Junya Ishigami’s flat “Glass Bubble” is perhaps less impressive and the Kondo/Matthias Schuler collaboration (a sort of cloud maker) looks more like a good source for witty jokes, models by the always thought-provoking Ito and the SANAA duo themselves show why they have reached the status of internationally recognized superstars. Ito’s influence on contemporary architecture is further confirmed by the works of other creative minds like Fujimoto and Hirata (the latter is also responsible for the striking pavilion which graces the museum forecourt). 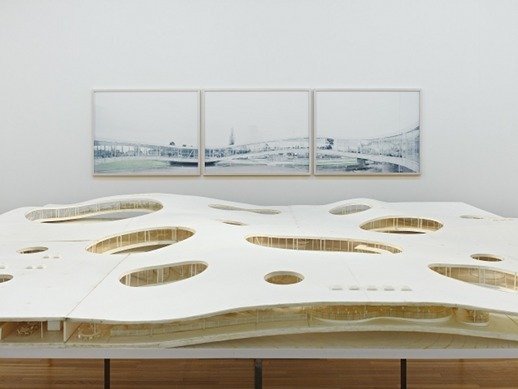 Ito’s imprint on the younger architects is such that if viewers don’t read the information on the side of the models, they could be forgiven for confusing the authors. All in all, the museum’s huge spaces, high ceilings and strong lights favor bold, big-sized projects over the many small object-like works that are scattered around its two floors. If, for example, the ultra-minimal intervention of Office Kersten Geers David van Severen (a simple white shadecloth put over a museum courtyard and all but invisible unless someone points it out) is too subtle for the MOT’s mammoth building, one work on whose striking beauty everybody seems to agree is Haruka Kojin’s wall of lenses. Kojin, who happens to be the youngest of the exhibitors, explores reality through two types of lenses, one completely flat and clear and the other with a curved surface, to create a surreal environment in which the images on the other side of the wall are distorted and sometimes appear upside down. The lenses themselves are completely transparent and become only visible through the objects and people whose shapes they endlessly transform. This is a gadget I would not mind having in my house, if my house were big enough. In conclusion, Yuko Hasegawa and SANAA have put together a diverse selection of projects. If at times the single parts outshine the whole, there is still enough food for thought here to keep viewers intelligently entertained, and everybody will find something to their liking.